WILLIAMSPORT, Pa. – After leading the Lycoming College football team to a shocking 43-42 win over 19th-ranked Delaware Valley, junior quarterback Chase Whiteman (Gettysburg, Pa./Gettysburg Area) has earned his first career Middle Atlantic Conference Offensive Player of the Week award, the conference office in Annville, Pa., announced on Sunday, Nov. 8. 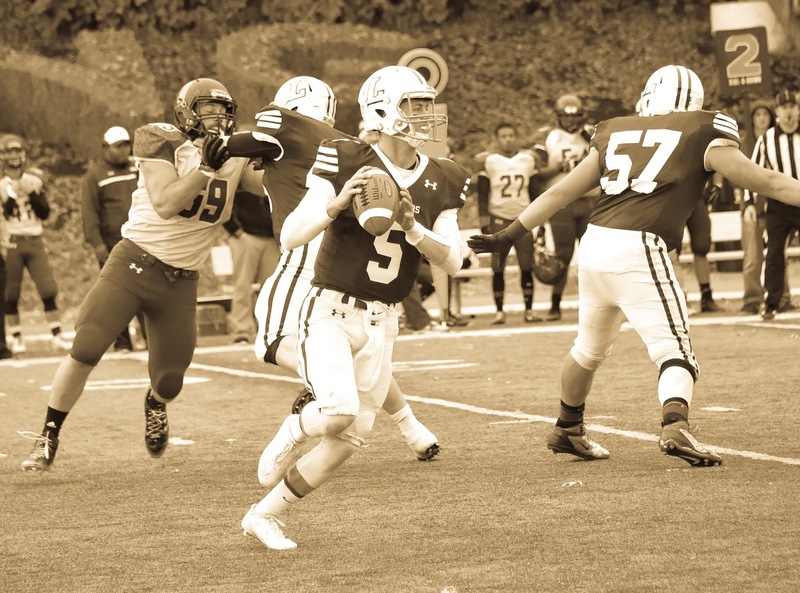 Whiteman accounted for 433 of Lycoming's 481 yards of total offense in the upset of Delaware Valley, which knocked the Aggies out of a first-place tie in the MAC. Down by eight points with 4:01 left, he led the Warriors on a 99-yard, 14-play drive by going 6-of-8 for 59 yards and rushing five times for 37 yards. After Lycoming recovered an onside kick with 55 seconds left, Whiteman led the Warriors on the game-winning drive by going 2-of-4 (with one spike) and he rushed for 11 more yards to set up the game-winning field goal with five seconds left. Whiteman had a career day for the Warriors, completing 27-of-38 passing for 372 yards and throwing for three touchdowns. He threw for three touchdowns and rushed for another, as he scrambled 16 times for 61 yards as well. The performance was also one for the record books, as his 372 passing yards is eighth in school history and the 27 passes completed are tied for seventh. The junior’s previous career-best was 225 yards against Wilkes, while his previous-best was 16 completions against Susquehanna. The award is the Warriors’ third MAC Offensive Player of the Week of the season, as junior Blake Bowman(Valley View, Pa./Tri-Valley) earned the award on Sept. 20 and Oct. 25. The Warriors wrap up their season on Saturday, Nov. 14, when they host Misericordia at 1 p.m. at David Person Field.